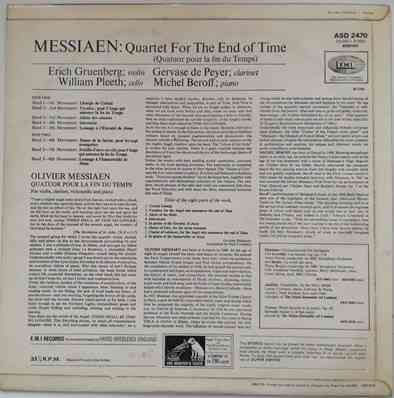 33rpm LP Record featuring Erich Gruenberg, violin; William Pleeth, cello; Gervase de Payer, clarinet; Michel Beroff, piano. Stereo EMI first pressing red semi circle label, 1969. UK pressing. Garrod & Lofthouse flipback sleeve. 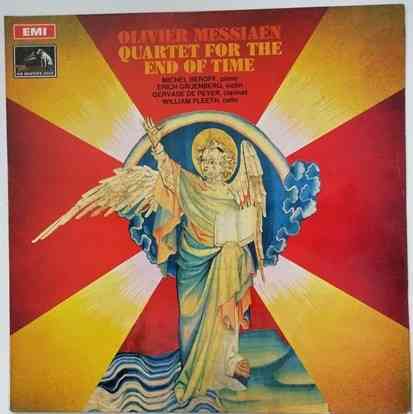 33rpm LP Record of ASD 2470 Messiaen QUARTET FOR THE END OF TIME, featuring Erich Gruenberg on violin; William Pleeth on cello; Gervase de Payer on clarinet; Michel Beroff on piano. 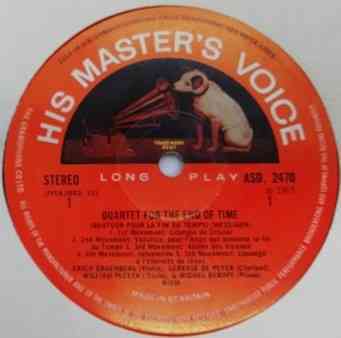 It was issued on the Stereo EMI first pressing red semi circle label in 1969. UK pressing. Garrod & Lofthouse flipback sleeve. The record itself is graded a bit less than excellent, with the odd light surface mark visible when viewed under normal house lighting. Play-tested on a USB turntable. Superb sound quality, with NO jumps, pops, repetitive ticks or crackle. Just about faultless playback. Minimal to no spindle wear. Labels very clean. No discernible spider marks. The outer flipback sleeve is graded a strong very good with just a little light wear and the odd bumped corner. The spine is intact and strong with no loss to the lettering. The inner sleeve has no wear to speak of apart from a little age toning.